INFINITE Studios, the first media hub development to be completed at Mediapolis, was officially opened yesterday. 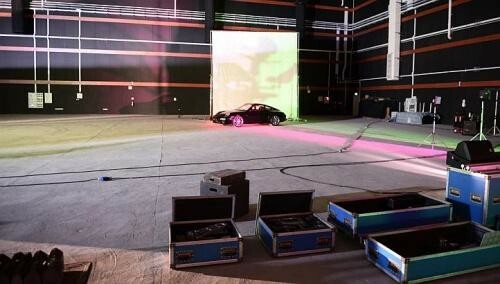 The building contains two fully operational sound stages, which are also the first of their kind here. A sound stage is a soundproof, hangar-like structure where everything from temperature to lighting can be fully controlled to meet the needs of any production, be it a movie, TV show or commercial. The two sound stages at Infinite measure 928 sq m and 1,681 sq m, and are equipped to support productions requiring complex set-builds, multi-camera operations as well as green screen technology for visual effects productions. Although the Infinite building was officially launched yesterday, it has been in use since October 2012 to shoot and produce commercials as well as last season's popular Australian children's TV show Hi-5, which was renamed Hi-5 House. Two international feature films will be produced at the sound stages later this year. One is a work of science fiction. Mr Mike Wiluan, chief executive of production company Infinite Frameworks, the anchor tenant of the building, said: "No one has done science fiction in Singapore before, and it's appropriate to do science fiction in the sound stages because it's about visual effects." Gracing the official opening was Minister for Communications and Information Yaacob Ibrahim, who said that the completion of the building means that "Singapore is ready to take on large-scale film and TV productions for a global audience". Mediapolis is the joint effort of four government agencies to make Singapore a regional media hub. Other than the sound stages, Infinite Studios is also home to other media companies including international TV business Discovery Networks, Japanese game maker Namco Bandai, and media service provider Globecast Asia.